The silhouette of an American beech (fagus grandifolia) and its leaves are the subject of this print. Beech, along with maple and yellow birch, dominate the northern hardwood forests of New Hampshire with oak and hemlock appearing with it at lower altitudes. I used leaves and as resists and inked "plates" to make the multiple-layered background for the beech monotype. Water-based inks were used throughout. 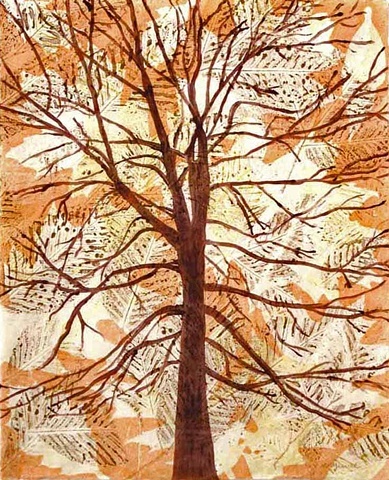 This print is one of a series of fifteen that features trees and their foliage "after September."